How to Reach: Majorda beach is very easily accessible as it is very close to the airport and the Margao railway station. 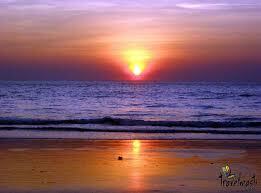 One of the most popular beaches, Majorda beach of Goa is located on the 26 kilometer stretch of fine white sand. This lovely beach looks absolutely mesmerizing with its white sands, blue water and swaying coconut trees. The blue sky and white clouds above only make it look even more magical and picturesque. The Majorda beach also has historical significance in India. It is believed that Lord Rama (of the Indian epic Ramayana) was kidnapped when he was a kid and was brought here. The Majorda beach is famous for other reasons too apart from the scenic sands and the blue sea. This beautiful beach is very popular for its bakery and it specializes in the baking of European bread. The bread is fermented by using the juice of coconut palm also known as today juice. This bread is famous till date and numerous tourists come here to taste it. Apart from this, Majorda is also famous for its huge variety of sea food that leaves you only craving for more. There are a number of luxury beach resorts and deluxe hotels located near the Majorda. These resorts and hotels offer world class services and make sure that tourists have the time of their lives while on this vacation in Goa. In case your budget does not allow you to splurge on luxury resorts and five star hotels, you can always try out budget hotels and local accommodation like guesthouses and shacks on the beach. These places also offer good quality services at reasonable prices and have rooms to suit every pocket. So come to Majorda beach and have the vacation that you have always dreamt of.